emergency wash stations must be within 10 seconds of an area where an accident may occur), a self-contained portable station would be perfect. This gravity-fed eyewash station can flush eyes for 15 minutes at a minimum rate of .4 gpm and only uses 7 gallons of water. Heated portable units will help prevent freezing in cold shops environments. This is another option if there is no water supply close enough to the work area. When they are installed, they are pressurized, and you can even get a cart for mobility. 10 and 15 gallon pressurized units meet the ANSI Z358.1 minimum flush rate of .4 gpm for 15 minutes. Plumbed units are permanently fixed to source of tap water, so they are attached to a faucet. These are not to be used as a substitute for a real eyewash station. Personal wash units may be used immediately after an emergency, but the injured person must go to one of the other eyewash stations right away for proper flushing. However, personal units are useful because they can be placed very close to employees and can be used for on-the-spot relief before using a proper fixture. Medically, this is the best type of eyewash fixture. The inverted stream flushes the hazardous material away from the drains of the eyes and nasal cavity, therefore reducing the risk of permanent harm. All types of eyewash stations can help in an emergency, but medical attention should be sought immediately after an accident. 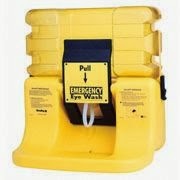 Click here to see emergency eyewash station and shower regulations.